Peanut Butter Pie. I am a huge fan of all nut butters. My whole cookbook is dedicated to them. Personally almond butter is my favorite, but my husband’s favorite is peanut butter. He just loves the stuff. So I created this super easy peanut butter pie for him as well as you peanut butter lovers out there! 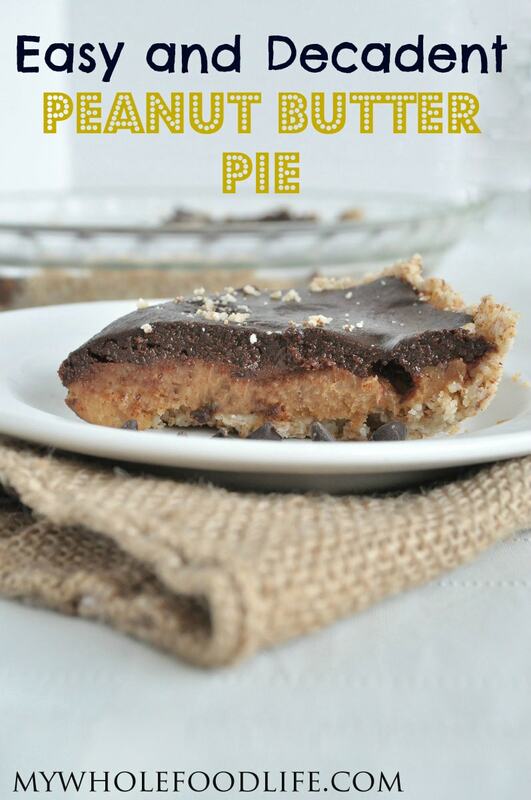 This peanut butter vegan pie has 3 layers. A nut and coconut crust, creamy peanut butter mousse filling, and chocolate ganache on top. It’s super rich and decadent. It wouldn’t take much to satisfy your sweet tooth. Just a small slice will do. If you didn’t want to use chocolate chips for the top layer, you can use the 3 ingredient chocolate recipe in this video. For more videos, you can subscribe to my You Tube Channel. A decadent treat that everyone will love! In a food processor , combine the crust ingredients well. Once well combined, press the mixture into a greased pie plate . Once the whole mixture has been pressed into the pie plate, stick it in the fridge to firm up. About 30 minutes. In a small saucepan , heat the peanut butter, salt and maple syrup on medium heat and stir only until both are mixed well and the peanut butter has softened a bit. Set aside to cool a minute or two. To make the filling, your can of coconut milk has to have been refrigerated overnight. Open the can and scoop out the solid white part into a mixing bowl . You can save the remaining liquid in ice cube trays to add to smoothies. Using the whipping attachment, whip the coconut into a "cream". This should take a few minutes. Once you see the coconut take on a whipped cream look, gently fold in the peanut butter mixture with a spatula. Pour the filling into the pie pan and set in the fridge to chill while you make the chocolate topping. To make the chocolate, use a small saucepan on medium heat. Add the chocolate and almond milk to the saucepan and gently heat the mixture, stirring constantly, until everything is well mixed. Make sure there is no lumps. Pour the chocolate mixture on top of the pie and stick in the fridge to set. It could take a couple hours for the chocolate to completely set. Enjoy! If you wanted to give this recipe an extra boost, you could sprinkle a little coarse sea salt on top of the chocolate. Give it a nice sweet and salty taste. Yum! This should last at least a week in the fridge. You may be able to freeze it, but I haven't tried. I made this for Thanksgiving this year and the recipe is a keeper! Thank you! Yay!! You are so welcome! I made this for my friend's birthday. I was worried the peanut butter would be too intense, so I substituted cashew butter. It was fabulous. Everyone loved it. Thank you for your recipes! It's so wonderful to be able to avoid processed sugar but still eat delicious desserts! You are so welcome! Glad it worked with cashew butter too!